This blue tongue skink care sheet mainly applies to the Northern skink, but most species and subspecies of blue-tongued skinks can be kept following these guidelines. These species are great for pet keepers who are beginners as they have lots of personality and great dispositions. These B-tongued skinks manifest unlimited personality and great dispositions. For hobbyists, these pets are worth the keep, as breeding them can prove to be challenging and certain blue-tongue species and localities are really rare. In Australia, these pet who loves to go after snails and slugs is a favorite animal for gardeners. Skinks are simple to care for, low-maintenance lizards, and make good pets for beginners and children, as long as their owners are prepared for their relatively large size compared to other pet lizards. Northern blue-tongued skinks are available per season, with a good number of litters dropped through August. 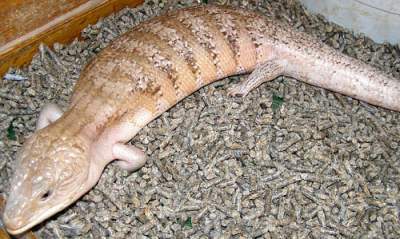 Other species, like the Indonesian blue-tongued skink (Tiliqua gigas gigas), are easier tp get at all season and are often imported, but the Northern blue-tongued skink are more difficult and make better pets overall. Before making payment, check for open ear canals, clean toes baring no sign of retained shed skin, and observe the total appearance of the lizards for signs of health. From $150 for babies to $250 for adults, the North blue tongued champion can sell for higher price when scarce. Rarer forms or high-colored forms can cost you more. 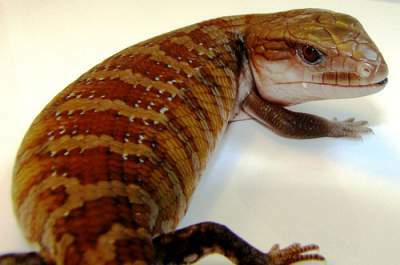 Rare blue-tonged skinks such as shinglebacks and centralians may cost between $1,500 and $5,000 each. The Northern blue-tongued skink is the largest blue-tongue ever discovered by humans. The complete length of an adult usually ranges between 18 and 24 inches. Kept and well fed, these blue-tongued lizards can live for 15 to 20 years, and possibly longer if condition is so favorable. Baby blue-tongues should be placed singly in plastic reptile enclosures, 20 gallon aquarium or terrariums with full aquariums with full tops. An adult blue-tongued skink requires, at barest, an enclosure that measures 36 inches by 18 inches wide by 10 inches tall, with a full screen top. The larger the size, the better. This particular skink is terrestrial and prefer floor space over climbing area. 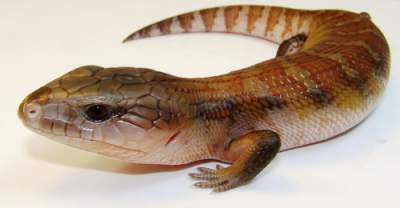 Ever y blue-tongued skinks, both adults and juveniles, are best kept separately. You might succeed in housing females together, or a male and female pair within a cage, but keep a keen eye on them. If they fight, keep them in different cages. Males must never be kept together. Through thermoregulation, Reptiles are able to control their temperatures, and it’s important for your blue-tongued skink enclosure to have a cooler end and warm end. Put all lighting and heating at one end of the enclosure, so if your blue-tongue gets too warm, it can head toward the cooler end opposite, and vice versa if it gets too cold. A thermometer at each end to monitor temperatures is advisable. Their enclosures should have ambient temperatures on the cool side from 75 to 82 degrees Fahrenheit. The warm end should have a basking area of 90 to 100 degrees. This can be done using an under-tank heating device, such as a heat tape or heat map, and/or an overhead heating device should be turned off at night. Remember, daylights bulbs should be set to a maximum of 12 hours per day. The cooler end of the enclosure can then drop to 70 degrees at night. There had been proven cases of blue-tongues being raised and bred successfully without exposure to full-spectrum lighting. I do however advice you try UVB lighting in blue-tongued skink cages. The UVB lights should be on e8-12 hours per day. Any UVB bulb will also offer UVA, which offers great benefits to blue-tongued skinks- blue tongue skink care sheet! Recycled paper substrates, fir bark, Aspen, and cypress mulch (as long as it’s kept dry) can all be used safely with blue colored-tongued skinks. Cedar chips, Walnut shells, clay cat litter, and orchid bark must never be used, as these substrates may lead to toxicity, impaction or respiratory health challenges and concerns. Whatever substrate you pick, make sure your skink does not ingest it. Accidental ingestions can be prevented by using a feeding fish. Keep the floor substrate clean and maintained as these lizard creature spend lots of time on the ground. Blue-tongues may climb over logs and rocks, but they are not very good climbers. Make sure the high areas are not where they can fall off. Correct housing materials such as large rocks, hide boxes, cork bark, Mopani wood, or other shelters should be employed. Do not over-design the interior of the cage with these items, as blue tongues enjoy lots of open space. Cluttering the cage with designs will do no good as blue-dragons will rearrange the place. These lizards are highly hardy lizards that will survive on just about any diet, but a well-balanced diet will give you a more active, healthier blue-tongued skink. Blue-tongues are omnivorous in nature and can be fed a combination of fruits, proteins, and greens/ Vegetables. It is important to be creative here. Try out better protein sources when feeding them canned foods. For each feeding, a ratio of 50 percent greens/vegetables, 40 percent protein and 10 percent fruit is a great combo. 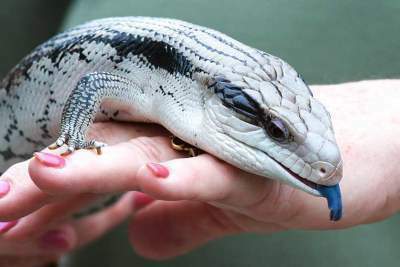 Adult blue-tongued skinks should be fed every 2-3 days. Young blue-tongues perform best when fed on a daily. Feed them as much as they will consume in one sitting. After your skink has finished filling his belly, uneaten foods should be removed soonest. A calcium/vitamin supplement with vitamin D3 is necessary, especially if you’re not providing creative and varied well-rounded menu. Sprinkle the supplement over your blue-tongue’s food every third feeding for adults and every other meal for young blue-tongues that are still growing and can use the extra nutrients. Below is a menu items list of foods that are appropriate for blue-tongued skinks. Feel free to try other types but avoid rhubarb, avocado, high sodium canned foods, Meats and citrus.- blue tongue skink care sheet! If feeding canned cat/dogs food to your blue-tongued skink, ensure to feed only super premium foods that contain no bone/meat meal and no by-products. There are countless foods that contain vegetables and fruits available in the market Preferred over 100% protein dog/cat foods; these should never be substitute for fresh foods though. Generally, cat foods often possess twice the protein of dog foods in the market, so if you plan to treat your blue-tongues with this great meal, I’d recommend dog foods over cat foods. If a skink is underweight, Cat/Kitten food will aid it put on some weight. Cat food can also be fed to skinks who are currently breeding. Just make sure to read the nutrition on manufactured foods. I advise avoiding corn-based foods, including foods that does not contain artificial colors, bone/meat meal, or by-products (including chicken by-products), as well as any foods that contain water as the primary ingredient. Sufficient clean water must always be accessible in the water dish. BT skinks are not excellent swimmers and must be able to easily get out of the water lest they die. Plus, ensure the water bowl cannot be tipped over easily to avoid accidents and mold growing in the cage. Northern blue tongue skink are from partial-dry area and really do not need high humidity but low humidly with enough ventilation. Northern blue-tongues ideal humidity level ranges from 25 and 40 percent. Merauke, Tanimbar, Indonesian, Kei Island, Irian Jaya and Kei Island blue-tongued skinks may need a little higher humidity levels in the 40 to 45% range. You can use a hygrometer to monitor humidity levels. Whenever you own a reptile, you should allow it to acclimate for a couple fo days. It should not be handled during this period until it is comfortable in its new environment. Once your new blue tongue skink care and is feeding normally, then handling can begin. At the start of this period, handling sessions should be limited ti 10 minutes or less per sessions. This can be carried out a few times each day during the acclimation process. Ensure you hold your blue-tongue close to the sofa, bed, or floor etc. in case you accidentally let the lizard free-dive. Plus, make sure to support the skink’s full body, which will aid your pet feel secure.- blue tongue skink care sheet! While lots of reptiles od not like being handled, and some merely put up with it, bluetongue skinks are very personable and at times love to be scratched on the chin or head. They seem to love the attention they getting. Blue tongue skinks will frequently reward and surprise their owners with their curious and friendly personalities. They are repfect for reptile enthusiast of all levels, and the intelligent and unique blue-tongued skink may just be the ultimate pet lizard! Like any other reptiles, the most common health challenge of skinks in captivity is the metabolic bone disease. This condition when the animal’s phosphorous-to-calcium ratio is blown outta proportion, and is usually as a result of Poor UV lighting and sometimes poor diet. Visible symptoms include weakened or fractured bones, lethargy, tremors, and overall weakness. Like other lizards, skinks can suffer from vitamin A deficiency. A supplement can help stop this from becoming serious. Reptiles, including lizards, all shed off their old skins at some point. If your skink sheds irregularly or isn’t able to shed fully, it may be as a result of an underlying health issue. Before you buy a blue-tongued skink, make sure there’s a veterinarian in your area who specializes in exotic pets like lizards. And while there should be no legal issues with owning one, make sure to double-check that it’s permissible to own one of these where you live. We always advise getting your skink from a reputable breeder, who will present to you the animal’s health history. Your lizard should have clear skins and eyes that is free from dry patches or blemishes (which may mean a skin condition. By watching the animal eat before paying for it, you’ll be able to tell if it has a Reptiles healthy appetite. A lizard that shows signs of incomplete shed, is limping, or shows any visible deformities probably has health issues and needs to be avoided. We hope you love this article focused on the blue tongue skink care today.